Who said Biryani can’t be made healthier? Truweight has brought its own version of this royal dish for you to enjoy it without any guilt of eating unhealthy. 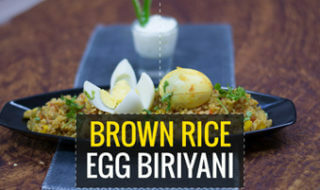 Weight loss foods needn’t be boring, a testimony being this tasty and quick to may brown rice egg biriyani. Among the easiest, flavourful, and delicious biryani; this one gets made with limited ingredients, all available at home. Make an onion raita with skim yogurt or a simple mint raita and you are set for a lavish lunch to befit a king and also your weight loss goals! Try it on today. Put oil in the pressure cooker. Heat it and then add cumin seeds, bay leaf, cardamom, cinnamon to it. Add ginger garlic paste, onions, green chillies, tomatoes to it and mix them all together while heating. Add yellow bell pepper and green bell pepper to it and mix them further. Add red chilli powder, coriander powder, garam masala to the mixture. Then add salt, water and the boiled egg, to it as shown. After heating, take out the boiled egg and then add the soaked brown rice to the mixture. Mix them and add water as required and cook well. You can now serve your tasty yet healthy version of biryani. Sunaina Roshan’s Journey- Then Fat and Now FIT!